Citation: C N Trueman "John Whitgift"
John Whitgift was appointed Archbishop of Canterbury in 1583 by Elizabeth I. She knew that Whitgift was anti-Puritans and that he would spearhead a royal desire for religious conformity in England and Wales. In this task, John Whitgift was not to disappoint. Whitgift was born around 1530. He was the son of a wealthy merchant. His father could afford to educate Whitgift and he attended St. Anthony’s School in London. After this, he went to study at Cambridge University. In 1555, Whitgift was elected Fellow of Peterhouse. During the attacks on Protestants during the reign of Mary, he stayed in England. Over the next few years, Whitgift acquired a number of posts – Lady Margaret Professor of Divinity (1563), Master of Pembroke (1567) and Master of Trinity (1563). Professionally in the academic world, he got just about as far as he could when he was appointed Regius Professor of Divinity and Vice-Chancellor of Cambridge University. Whitgift became Elizabeth’s chaplain in 1563. Such a position was very prestigious but it also meant that Whitgift had access to the Queen. Over the years it became clear to her that Whitgift shared her views on conformity, though for the Queen it was as much a political issue as religious. It is likely that Whitgift only took his stand from a religious viewpoint. When Edmund Grindal, Archbishop of Canterbury, refused to condemn prophesying he was replaced by Whitgift (1583). He was the obvious man to support Elizabeth and to place him in the most important religious position in the country gave Elizabeth many advantages. In 1586, Whitgift was given a position on the Privy Council. Whitgift pursued non-conformists with a vengeance. However, the actual policing of them in a city the size of London was very difficult. Despite his best efforts, groups such as the ‘Barrowists’ grew in Islington. Whitgift produced his ‘Three Articles’, which were designed to effectively trap those he labelled non-conformists. If someone swore to uphold the ‘Three Articles’ they had to leave any non-conformist group they were in. Those who refused to swear to uphold them were, in the case of practicing ministers, deprived of their ministry. Those who held no church positions simply identified themselves as non-conformists to Whitgift. The ‘Three Articles’ were considered by the likes of the highly influential Lord Burghley to be too draconian and he asked for them to be watered down. By degrees they were, but the impact of the ‘reformed’ articles was still as marked. Whitgift insisted that all clergy uphold Royal Supremacy and the Book of Common Prayer. The Court of High Commission gave what he did the legal clout it needed. The head of the High Commission was Whitgift. Non-conformist leaders could pay a very heavy price for their beliefs. Henry Barrow and John Greenwood, both leaders in the Congregationalists (though followers of Barrow tended to be known as ‘Barrowists’) were executed for sedition. However, Whitgift did make one mistake. He concentrated all his resources on enforcing conformity and eradicating non-conformity. As a result, he failed to fully tackle issues within the Church itself and few doubted that problems still existed. As a result, when James I came to the throne in 1603, the remaining Puritans gained new hope and renewed energy. It was Whitgift who crowned James king. 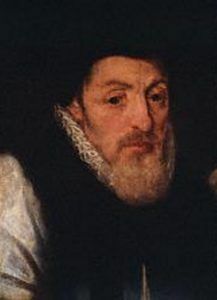 John Whitgift died on February 29th 1604.